Are Your Legislators Voting to Protect Our Water? The revenue deals initially negotiated by the General Assembly and Governor Wolf as part of the state budget were a raw deal for Pennsylvanians. Each chamber advanced revenue bills that would’ve sacrificed clean air, clean water, and public health. Create a special legislature-dominated committee to approve any air quality permits regulating emissions from oil and gas operations. The clear intent here is to prevent approval of proposed controls for methane emissions from new sources. Allow industry in some cases to hand pick third party agents to review and approve their permit applications. These third-parties are accountable to no one and there’s no conflict of interest provision to prevent a consultant from reviewing their own application. Allow oil and gas permits to be ‘automatically’ approved after a certain number of days, even if the applications don’t meet state clean water requirements. Allow conventional oil and gas wastewater facilities to continue accepting and discharging gas drilling wastewater into our waterways under long-expired lax permits. The Growing Greener Fund, which distributes funding for state park renovations, water and sewer system upgrades, and farmland preservation projects. The Recycling Fund, which allocates funds to municipalities for the planning, processing, resource recovery, and recycling of solid waste. The Keystone Recreation, Park, and Conservation Fund, which invests in recreation, conservation, historical preservation, education, and needed upgrades of libraries. 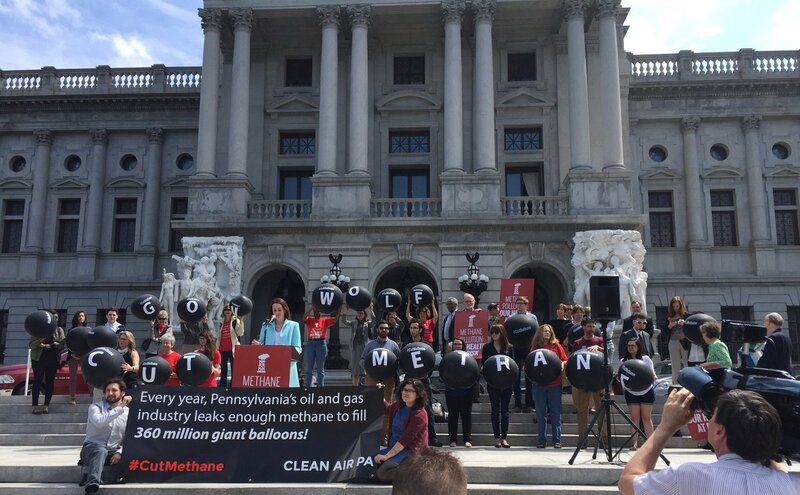 Sticking anti-environmental riders into bills meant to deal exclusively with the state budget has become an annual tradition because legislators know these policies could never stand up on their own merits. In early November, Governor Wolf finally signed budget bills sent to his desk from the state legislature. Thanks to the thousands of calls, letters, and emails from across the state, this budget largely was free of the damaging anti-environmental provisions that both the House and Senate passed at one point or another in the budgeting process. This was a big win for clean water and a sign that our voices are being (finally) heard in Harrisburg! The Trump Administration is seeking to repeal the Clean Water Rule. This would undo important protections for thousands of acres of wetlands and nearly 10,000 stream miles in Pennsylvania which serve as sources of drinking water and recreation as well as support many diverse job sectors, like small local breweries and tourism. The administration’s proposed repeal recently went through a public comment period. During this time Clean Water Action was able to generate over 2,300 comments from Pennsylvanians in opposition to this effort. 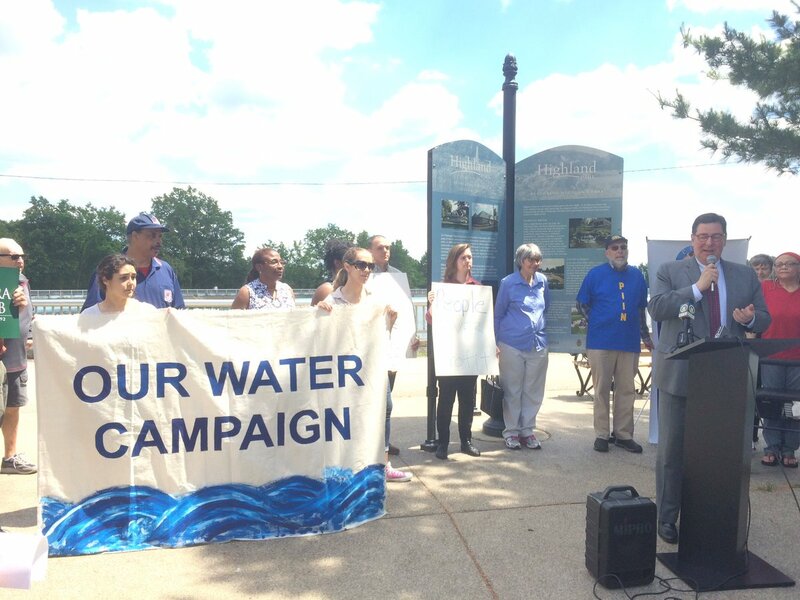 In conjunction with eight allied organizations, Clean Water Action organized an action at the EPA Region 3 office in Philadelphia to deliver our combined 20,000 comments and to hold a press conference to draw media attention to the issue. We also worked to get members of the Pennsylvania Congressional Delegation to weigh in. We were successful in getting U.S. Representatives Doyle, Brady, Boyle, Cartwright and Evans as well as U.S. Senator Casey to sign onto Congressional letters to EPA Administrator Scott Pruitt which opposed the rescinding. Their comments called this a deeply concerning action that ignores science. We now need to encourage our Republican elected officials in Pennsylvania to echo that same message. Clean Water Action remains at the forefront of working in Philadelphia and Pittsburgh to address ongoing issues related to lead in drinking water. Lead exposure has long been known to have neurotoxic effects on humans, especially on children’s developing brains. Childhood exposure to lead can have developmental disorders, including lowered IQs and increased aggressive or violent behaviors. Over the summer, the Philadelphia Inquirer ran a story about how the industrial past of Philadelphia’s River Ward neighborhoods was impacting its present. The newspaper discovered that a development boom was churning up a toxic legacy of poisonous soil contaminated by the 14 lead smelters that once operated in this area. The result was that three out of four soil tests had hazardous levels of lead. High levels of lead dust were also discovered on row house stoops and sidewalks near construction sites. In response, Clean Water Action partnered with the Fishtown and Kensington Neighborhood Associations and Public Citizens for Children and Youth to hold several panel discussions about how lead is impacting resident living and working in the River Wards. The first session featured a health professional, a toxicologist, and a resident whose children suffered from lead poisoning. The second session featured representatives from EPA, Agency for Toxic Substances and Disease Registry, and the Philadelphia Health Department who reported on the findings from the recent study of River Ward soil. Through these sessions, attendees gained a historic understanding of the toxicity of lead, sources of exposure, how it’s measured, what those measurements mean, the health impact of exposure, and what steps they could take to reduce and mitigate home and environmental exposure. In Pittsburgh, Clean Water Action is a part of the Our Water Campaign fighting for safe, affordable, and publicly controlled drinking water. Our recent efforts have been promoting and supporting city efforts to distribute 20,000 water filters as well as pass legislation that stops all partial lead-line replacements, asserts Pittsburgh Water and Sewer Authority’s (PWSA) right to replace private lead lines, provides low-interest loans to homeowners who upgrade their pipes, and requires landlords to make information about their lead service lines public. Clean Water Action has also promoted legislation countywide that requires all children in Allegheny County at ages one and two to undergo a blood test to detect lead. Clean Water is now advocating for a moratorium on unjust water shutoffs and pressuring PWSA to create a Customer Assistance Program (CAP) to help lower-income residents pay their skyrocketing water bills caused by previous mismanagement of the authority. Pittsburgh is in violation of the Clean Water Act because its aging and antiquated combined sewer system causes raw sewage to be dumped into its rivers during heavy rain events. The Environmental Protection Agency has given the Pittsburgh region three to four years to prove they want a green-first solution to address this problem. That’s a short time but fortunately the Four Mile Run project in Pittsburgh’s Schenley Park provides a model opportunity to demonstration that commitment and that sustainable solutions are easier, faster, and less expensive to implement. The project has the potential to bring upwards of $300 million in benefits to the community with one investment! Not only will the project remove close to 900 million gallons of sewage from local rivers, but it will also help mitigate dangerous flooding and beautify parks and communities. Area governments and institutions need to step up and make the investments necessary to ensure this project becomes a reality. Pittsburgh Mayor Bill Peduto has already demonstrated his administration’s commitment by earmarking funding the city’s capitol budget. Clean Water Action is working to persuade Pittsburgh City Council to support the mayor’s proposal and to encourage others to make a similar investment. The Trump Administration is closing in on being in office for a year. In that time we’ve seen them push an anti-environmental agenda that has included rolling back protections for our nation’s rivers, streams, and wetlands and preventing implementation of rules to control methane emissions from oil and gas operations on public lands. See how your federal elected officials stack up against this polluter friendly agenda by checking out our recently updated Congressional tracker.